Round silver watch casing framed with a dolphin on the top and bottom, a white watch face with black natural numbers and swiping second hand, the band is 1 inch silver-tone safety pins, beaded with ocean blues seed beads,and stretchy jewelry cord - fits most wrists. Watches can be custom made for the smaller or larger wrist size, just convo me when placing your orders. 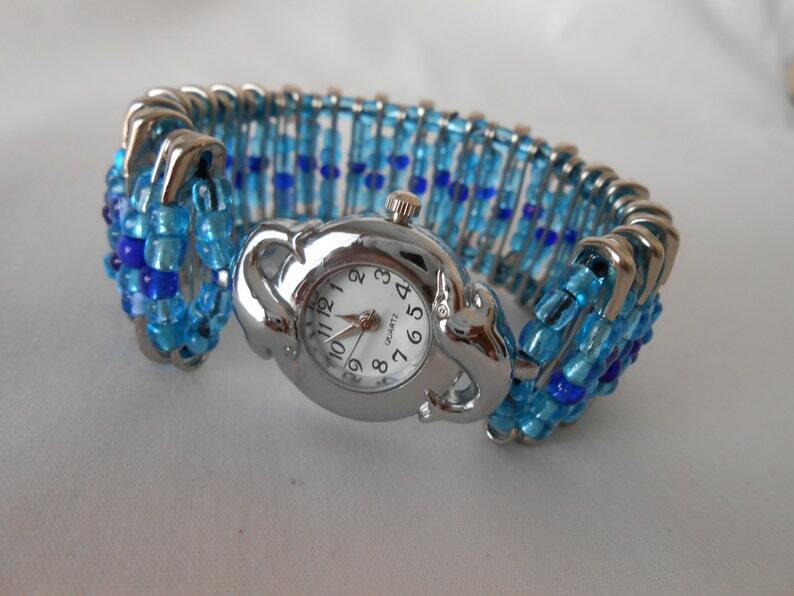 Bead between the Lions Safety Pin Beaded Watches, Bracelets and Bangles may be handcrafted and personalized to your desired colors. Please convo (contact; braceletlady [!at] beadbetweenthelions.com) before placing order to confirm colors and/or if a custom order pricing adjustment applies.